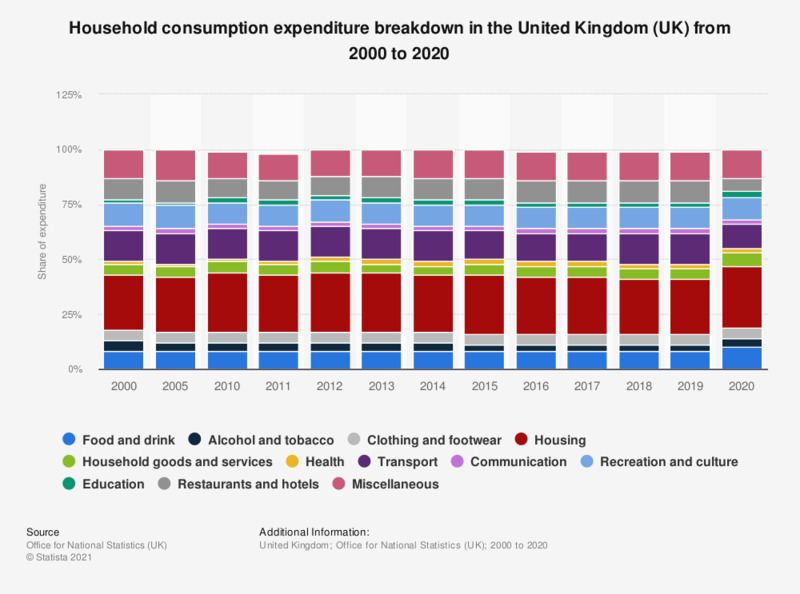 This statistic shows total domestic consumption expenditure in the United Kingdom (UK) from 2005 to 2016, broken down by spending categories. In the period under consideration, household expenditure has remained fairly stable with only slight changes in the share of spend. Food and drink, for example, has decreased from nine percent in the year 2000 to eight percent by 2016. Household consumption expenditure looks at the overall spending on consumer goods and services of a wide variety. Some examples are government licenses and permits, such as a passport renewal or the price of train tickets to get to work. Housing may also be accounted for in these figures. This figure is measured by how much the consumer actually pays at the point of sale. All fast moving consumer goods such as beer or cigarettes are also accounted for in this data. Values may not added up to 100 due to rounding.